TuneFab Apple Music Converter 2.2.3 (Win & Mac) was available as a giveaway on May 21, 2017! TuneFab Apple Music Converter is a perfect tool for Apple Music subscribers who want to play Apple Music tracks on more devices. For example, play Apple Music songs on iPod nano, iPod shuffle, iPod classic or MP3 players. This software can help to convert protected Apple Music to common formats, such as MP3, M4A, AC3, AU, AC3, FLAC, AIFF or MKA. Also, it works with iTunes M4B and Audible AA, AAX files so you can convert Audiobook to popular MP3 or M4A. It is a must-have tool for music and audiobooks lovers. TuneFab Apple Music Converter (for Windows): Windows 7/ 8/ 8.1/ 10, 1GHz processor or above; Monitor with 1024x768 pixels or higher resolution; 512MB RAM; iTunes 12.2 or later installed (Latest version of iTunes is recommended); TuneFab Apple Music Converter (for Mac): Mac OS X 10.9, 10.10, 10.11 and 10.12; 1GHz processor or above; Monitor with 1024x768 pixels or higher resolution; 256MB RAM; iTunes 12.2 or later installed (Latest version of iTunes is recommended). How would you improve TuneFab Apple Music Converter 2.2.3 (Win & Mac) ? 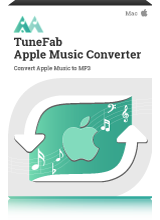 TuneFab Apple Music Converter is an all-in-one iTunes audio converter which converts Apple Music songs, M4B, AA, AAX audiobooks and M4P music files to plain MP3, AC3, AIFF, FLAC, etc. for playback on any device. It helps you to play Apple Music songs on iPod and MP3 players. A great utility for Mac users to convert Apple Music to MP3 so as to play Apple Music to presently unsupported devices, such as iPod shuffle/nano/classic, PS4, Xbox, etc. It is also capable of converting Audible AA/AAX audiobooks to MP3/M4A for playback on more device. 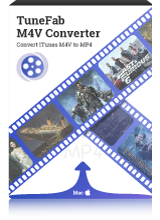 TuneFab M4V Converter lets you convert iTunes purchased or rented M4V videos to MP4 so that you can play the videos on various non-Apple devices, such as Samsung Galaxy S8, PS4, Xbox One, Creative Zen, etc. It gives you more freedom to enjoy the iTunes rental movies by breaking the limitation of 24 or 48 hours watching period. This is working well so far! I've been needing something to convert my pre-2009 iTunes purchases. Thank you GOTD and TuneFab Studio! Pity it's only for six months. I have a few songs I purchased from Itunes that I would have liked to convert. I now use Media Monkey with my Ipod, and have uninstalled ITunes. According to the requirements, this software requires Itunes so this is useless for me. If you're only going to use Itunes anyway, why would you need a converter? Lots of other people would probably like to convert their DRM protected songs that they bought from ITunes to put on their Android phones or other music players. Come back when you have a product that doesn't require ITunes. I have a few songs I purchased from Itunes that I would have liked to convert. I now use Media Monkey with my Ipod, and have uninstalled ITunes. According to the requirements, this software requires Itunes so this is useless for me. If you're only going to use Itunes anyway, why would you need a converter? 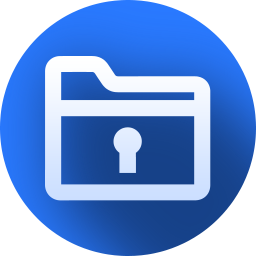 Lots of other people would probably like to convert their DRM protected songs that they bought from ITunes to put on their Android phones or other music players. Come back when you have a product that doesn't require ITunes. Installed fine BUT will NOT stay activated. Tried on 3 different PC's and all have the same issue. I put in the Registration Code as directed to unlock the software and it says "Activated Successful", but the software when open says "unregistered" and you have to enter the Registration Code AGAIN! Any solutions? PEDERASI DOLNI, you can get this software at only $39.95 for lifetime use. If you use the discount code provided, it is even cheaper. Sounds like a good program, but I don't usually install trail versions unless I really need it. I thought giveawayoftheday was giving away licensed software. not letting us download a 6 month trial. but if this is something you need then I guess you being able to try it out first before purchasing is good for you. Not for me. thanks anyway. Installed quickly and easily. Has an organized and practical screen layout. Will give it a whirl. Thanks GOTD! Question: When the free license expires after 6 months, what happens? Can you still listen to the music you've already converted, or do your older conversions remain untouched and you only lose the ability to convert new music? Jon651, It was certainly nice of the developer to respond in such a timely manner to this question. Jon651, when the free license expires after 6 months, you can still listen to the music you've already converted. You only lose the ability to convert new music. I personally don't "get" this software. I've got an iPad, iPhone, iPod and an Apple Tv, and anything that I've brought through iTunes will play on any of them no problem. Even my iPod, so I don't know what this software is going on about. Any music I've got through iTunes, always plays on another device such as my PC or TV without having to re this or re that. I just open my iTunes folder and copy it to what ever and it plays fine. So I'm sorry. I really don't know what your software is going on about. It's also a shame that its only a 6 months license. I think this software is only for iTunes Music subscribers. And if they don't have any software that can record simply via their device drivers or ASIO then that's their fault. Does Audacity do this for free? Anyway, will pass on this one. Richard Sebire, this software may be unnecessary for Apple-devices users. But at this moment, many non-apple devices still don't support Apple Music, let alone iPod classic, iPod nano and iPod shuffle don't support Apple music, too. This software may be helpful if a user own an iPhone and an iPod, MP3 Player, Samsung TV, Chromebook, etc.